The School Council system at Mill Hill is a fully developed and important aspect of school life, which ensures that pupils have a say in exactly what matters to them the most. The opportunity for interaction between pupils, teachers and other adults through the various School Councils has a positive impact on relationships, attainment and discipline; high levels of pupil involvement and care help pupils feel better integrated and motivated at Mill Hill. 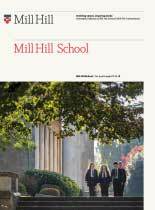 It is these essential underlying principles which provide the basis for the current School Council system and contribute to the unique sense of community within the Mill Hill School Foundation. There is a staff representative who facilities the meetings of these councils.